DEC RD53 hard drives are notorious for failing due to the heads getting stuck. The drive will spin up and then spin back down a little while after it gets up to speed. You won't hear the normal sound of the heads moving to track zero. See page 1 page 2 and page 3 These say one cause is due to a rubber bumper that gets sticky preventing the heads from moving off it. That was the problem with my drives. People have successfully opened the drive and freed the heads. The consensus is that without removing the bumper the heads will soon stick again. The first drive I fixed was is still working fine so the rubber may no longer be that sticky. The second drive was much more difficult. I freed the heads and all seemed well except not all heads were properly aligned with the tracks. 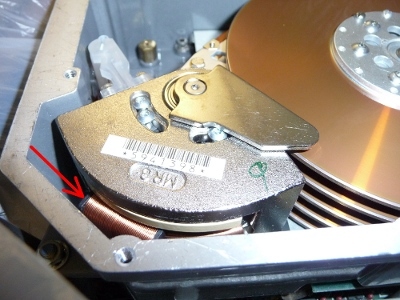 During effort to recover the data the heads retracted to the stop and after that the drive would spin up and spin down and moving the heads did not help. The drive uses Hall effect sensors for coarse speed control but needs to switch to locking to the servo data to control the drive speed after the drive is close to the design speed. If it can't it spins the drive back down. If the rubber bumper deteriorates too much, the heads will not be over the servo area so the drive can't close the speed loop. Adding a shim on top of the rubber bumper can fix the problem. I needed .007" to make my drive reliably spin up. If you probe the output of the servo head amplifier you can see it's not getting valid signal. One of the pictures at the bottom shows how to unlock the head and a shim installed. I wasn't able to manually move the heads and get the drive to properly initialize. Only the shim fixed it. The picture below shows where to push with a non-magnetic and non-conductive tool after the drive is up to speed to free the heads. More pictures in the links below. The DEC RD53 are rebadged Micropolis 1325 drives so the same repair should work on them. Online information says that soldering a jumper at R7 makes the 1325 drive act like a RD53.